The painting is stunning. The family members were all assembled for the unveiling and all gasped with astonishment when they saw it. No one could believe such a high quality oil painting was created from a photo! The painting is now a lifetime family treasure. ( Brian Thomas email us the framed painting when he receive it. "The painting was gorgeous!!! I am sending you this picture of my parents with the portrait you painted. We surprised the family having them dress the same!" Do you want to keep your smile on oil painting canvas as Mona Lisa? Do you hope to prepare perfect gift for your friends? Yes, I am sure you want them! Please send your pictures to email Info@YouFineArt.com. 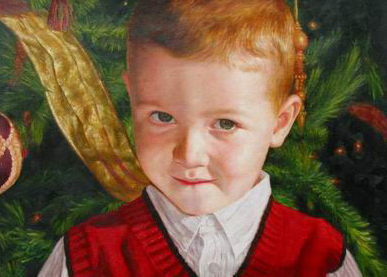 Our talented artists will paint the excellent portrait for you or your friends. Please enjoy our professional service. Your photos will be converted into museum quality oil painting on canvas by our genius artists. You may submit any subject of photos including wedding moment, playing balls, fishing, and birthday celebration etc. To let you know our artists capacity,we lists some samples from real orders for your reference. You are welcome to drop any suggestion. All paintings are 100% Hand painted by our talented and professional artists. You can check our sample quality here. The Perfect Customized portraits that you'll be proud to hang on your wall. We are the studio and direct supplier. So our Prices of paintings from photos are the most competitive. If you find better prices elsewhere, please let us know and we will beat their prices by 5%. Our goal is to make portrait from photo affordable for as many customers as we can. We guarantee 100% satisfaction. When we finish the paintings. We will take photos for your confirmation. If you are disatisfied with any place of the painting. Just tell us. We will improve it. Till you agree with it. If for any reason you are not completely happy with your painting, simply return it within 20 days for a full refund. We can not only paint you any photo but also can change any existing painting or photograph as per your instructions. We can add your photo into a painting, we can paint your photo into any style, we can change a painting to fit your colors and more and more. Do not asking "if we can" do something - because the answer will always be "yes". All Oil painting in our website are handmade in traditional way, by Our famous artists who begin with a blank and good canvas. They step by step create a beautiful hand-painted oil painting from photo. Our artists hand paint each oil painting painstakingly and beautifully. You can click to see our oil painting process.